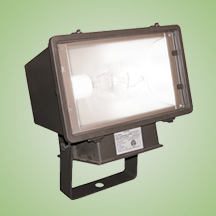 The LRF Flood Light is our most powerful compact HID light ideal for site, display, landscape, and general security lighting. Designed as a “power flood”, it can be used to accent large, wide tree canopies or cover large areas for security. A number of shielding options are available for customized effects. Designed as a “power flood”, it can be used to accent large, wide tree canopies or cover large areas for security. A variety of shielding options are availble for added light control. Available in 70W thru 400W standard metal halide, pulse-start metal halide, high pressure sodium, and mercury vapor. Comes standard with a 4KV pulse rated medium base socket. Each 60HZ CWA Multi-Tap1 or 480V ballast is pre-wired and installed for convenience. Standard mounting options include an adjustable yoke mount. Additional mounting options such as a 2-3/8” OD tenon, wall mount, and tree mount bases are available.